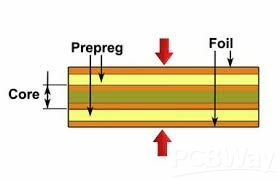 A prepreg is also called “PP sheet”, it is one of the main materials in the production of multilayer boards. It is mainly composed of resin and reinforced materials. Reinforcing materials are divided into several types, such as glass fiber cloth, paper base, composite materials, etc. Most of the prepregs (bonding sheets) used in printed boards are made of fiberglass cloth as a reinforcing material. After treatment of glass fiber cloth, impregnated with resin glue solution, and then heat treatment (pre-bake) to make the resin into the B stage and made of sheet material called prepreg, which will soften under heat and pressure, will react and solidify after cooling. Since the number of yarn strands in the warp and weft unit lengths of the glass fiber cloth is different, the latitude and longitude directions of the prepreg should be taken into account when cutting. Generally, the direction of warp (the direction of curling of the glass fiber cloth) is used as the short side direction of the production board, and the weft direction To produce the long side of the board to ensure that the board is flat and prevent the board from being distorted after being heated. The main appearance requirements of the prepreg used for the multilayer board are: the cloth surface should be smooth, free of oil, stains, foreign matter or other defects, no cracks, and excessive resin powder, but microcracks are allowed. In the pcb design process, if it is a multilayer board design, prepreg must be used. In addition, in the process of multi-layer board copying, it must be polished out in order to accurately analyze the schematic circuit diagram. Circuit boards cores are pre-pressed layers according to the pattern: copper foil – prepreg – copper foil. PCBWay also manufactures PCBs with metal cores. The copper for the outer layers of multilayer boards is applied in the form of copper foil and pressed together with the prepregs / cores. PCBWay have copper foil of 35μm and 70μm in stock.